Although I used Python a long time and OOP, I never really dwelled into the reasons that someone would use super instead of other ways in Python. Usually I would use other ways in an effort do avoid confusing words and those ugly underscores. Sometimes however it is worth making something a bit less readable and such a case is super. Why should you learn to use super though? For a single reason.. super equals less headaches. Remember that with initializer I merely mean the __init__ method of a class. So let’s take for example the class A below. The result is a hybrid class – half A, half B. The problem is that both classes have an initializer and in such cases the hybrid’s methods, variables, etc. are preferred. So in practice B has the method hello that it inherited from A but will only run its own initializer. The self always makes me dizzy so I will explain a bit on it. Namely why can’t we just have A.__init__()? The reason is that A is not an instance but a class. self however is an instance and that’s why we use it. As you might have noticed though, it is an instance of B and still we pass it to A as if it was an instance of A. So why the hell does it work? The reason it works is that as we said B is a hybrid – half A, half B. This is very similar to having a double citizenship. A half Greek, half Norwegian can be recognized in both Greece and Norway. In the same way A and B can be recognized as either A or B. Logical, aye? The above example works fine. But what if one changes the name of A into G? For a simple example like ours, we could just change every occurence of A into G. However if you are dealing with medium to large projects you might have many classes that inherit from A and way many files. Furthermore if you have tests, you probably have all sort of test classes that inherit as well. The point is that in such cases a little change somewhere can invoke havoc. The programmer will need to keep track of every single place where we inherit class A which just is not practical. That’s where super comes into play. Now, no matter if you rename A to G or V, you won’t have to make any changes to classes that inherit from that class! So you saw how super takes away the problem of having to keep track of class names we inherit from. I think all this makes much more sense when we inherit from multiple classes. At first glance this looks like we merely minimize the code to a single line. The real benefit however is that if we did not use super, now our class B would be much more prone to mistakes since either A, X, or Y might change name somewhere (more classes – higher probability of a rename). I hope all this makes it very apparent that in big OOP projects where you have a lot of interaction between objects, classes, etc. Using super is just a simple trick that adds a huge gain for the programmer. So whenever you need to call an initializer (or any other method) from a parent class, please save yourself some trouble and use super! You might have noticed that I use object in every parent class in the examples above. In Python 3 you don’t have to do this. Categories: Abstract, OOP practices, Python | Tags: Good practices, inheritage, OOP, Python, super | Permalink. This is a tutorial on hex which is very useful if you are ever going to read low-level code or program low-level things like network protocols or microcontrollers. 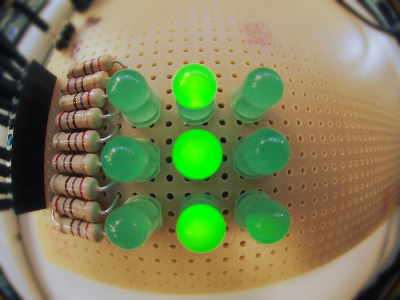 I use a real project that I worked on to showcase all this, namely a matrix of 9 LEDs. You should be able and understand why people put hex in the code instead of raw binary (if it exists for that programming language). There are very specific reasons for doing this and since converting from hex to binary is so damn easy, there is no excuse for you to not be able and do it in your brain. I was building a trivial LED matrix the other day for an MBED microcontroller (think Arduino-like). The usual problem is that my brain is faulty so I do all sorts of things in the wrong way. I take this blog as the opportunity to make up for what I learn just to make sure that I won’t forget (and ofcourse to teach others if they are interested). This star is made out of two LED patterns: a star and a cross. Now, the problem is that when we deal with low level programming, most low level languages (C, C++ etc.) don’t let you write numbers as binary in your code. You can’t write printf(0b101) for example. You need separate libraries if you want to do that and that would be fine for our case. But imagine if there was a matrix of 100 LEDs. Someone reading printf(001001010101101010101010101010101110101001011100101) would just get lost in the 0s and 1s. That’s one of the big reasons hex is used – it’s super minimal. 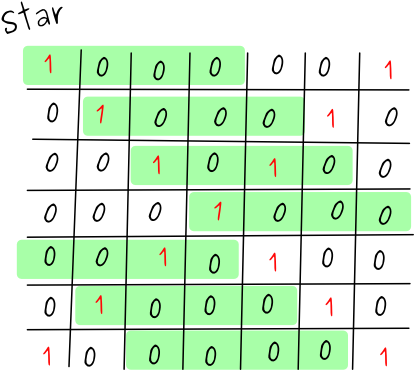 At first when I wanted to create a star, I simply converted each binary to an integer and just put it in my code. Below you can see a simplified version of my code. Notice that I omit the extra 0s since they don’t add any value just like 000150 is always going to be 150 no matter how many zeros you add at front. The code I used, worked fine. The problem with this solution is that it’s impossible to have a clue what an integer is in binary – and when we deal with low-level programming that matters most of the times. In our case for example each single 1 and 0 controls one LED. Being able to figure out fast the binary of a number in this case is very important. How can you tell if it’s the STAR1 or STAR2 that looks like an ‘X’? It’s just impossible. And what if there were many more stars or if the LED matrix was huge? Then it would be a nightmare to understand the code. That’s where hex comes in handy. A skilled programmer would directly see 0001 0101 0101 and 0000 1011 1010 with no effort. And he wouldn’t either need to decode the whole number to find out. Watching just the last hex digit of each STAR would give him (or us) a hint about which STAR is which. It’s time we become that skilled programmer, don’t you think? Hopefully you get the hang of it. The question is.. what happens if we have 0x102? This might seem tricky since we get three very simple binaries: 1, 0 and 10. But as I said, if you add the 0s in front before you squeeze them together, you should get the correct value – in this case 1 0000 0010! Then it’s quite easy to find in brain all the rest. For example to find the binary of B we can simply think that A is 1010, and that since B is just one step ahead, we add 1 to it and thus get 1011. Or to find 5 we simply have to add 1 to 4 which becomes 100+1=101. And so on. This should also make it clear what the command chmod 777 in Linux does. The below is more like an exercise to test what we’ve learned. It should be rather simple to find the hex of the star below. It might seem overwhelming, but the only thing you need to do is go in groups of 4s and write down each hex value. Decoding the above becomes 8388A08388A0 which is WRONG. This was actually a trap to teach you the hard way that we should always start from the last digit. In this case in the end we are in a situation where we have an orphan digit 1. We can’t work with that since we need 4 digits to make a hex number. The right way is to always start from the end. 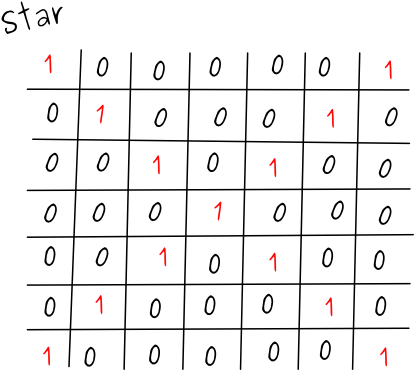 This is for all numbers no matter if they are represented in binary, octal, hex, decimal or whatever – as long as they are numbers, always start from the last digit and you’ll do fine. The reason is that when you finally get to the last number you can add as many zeros as you like (or need) without altering the value of the whole thing. And then we just start from the bottom and get 1051141051141! Notice that in the end we again have a single 1 (at the top left this time), but this time we can add as many zeroes as we want since adding zeros in front of a number doesn’t change its vallue. Categories: Abstract, Algorithms, C, Python | Tags: base conversion, c, C++, decimal, hex, LED, low-level programming, MBED, microcontroller, Python | Permalink. So as an intern in a big company I was given the task to get comfortable with docker. The problem is that docker is quite fresh so there isn’t really that much of good tutorials out there. After reading a bunch of articles and sparse tutorials (even taken the official tutorial at https://www.docker.com/tryit), I still straggled to get a firm grip on what docker even is supposed to be used for. Therefore I decided to make this tutorial for a total beginner like me. There are many different explanations on the internet about what docker is and when to use it. Most of them however tend to complicate things more than giving some practical information for a total beginner. Docker simply put is a replacement for virtual machines. I will use virtual box as a comparison example since it’s very easy for anyone to download and try to see the differences themselves. 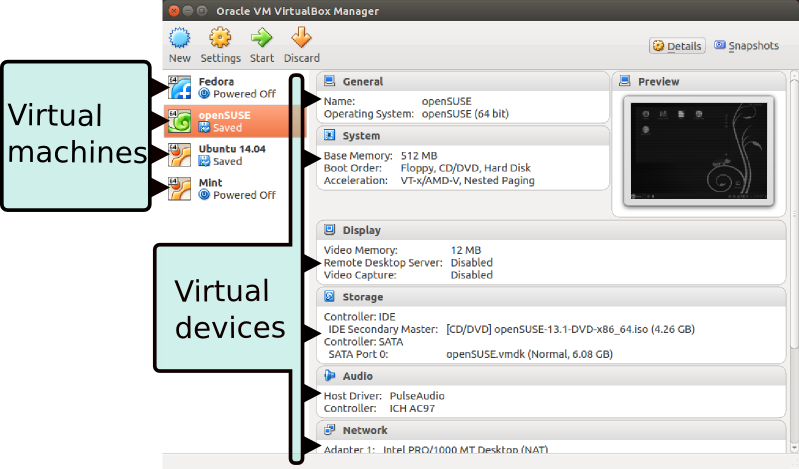 The application VirtualBox is essentially a virtual machine manager. Each and every of the OSes you see in the picture above, is an installed virtual machines. Each such machine has it’s own installed OS, kernel, virtual devices like hard disks, network cards etc. All this takes a considerate amount of memory and needs extra processing power. All virtual machines (VM) like VMware, Parallels, behave the same. Now imagine that we want to use nmap from an OpenSUSE machine but we are on an Ubuntu. 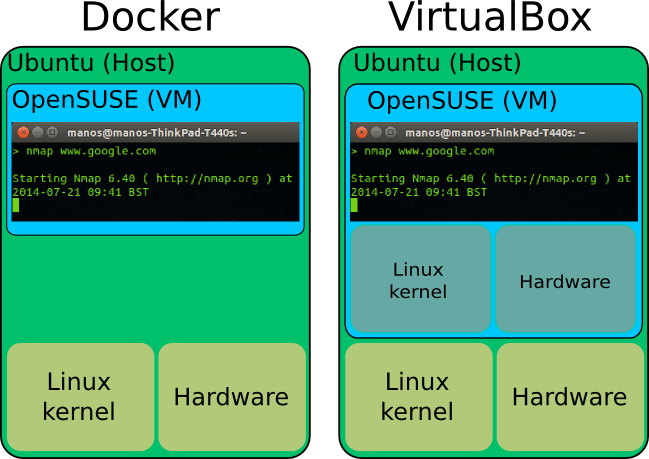 Using VirtualBox we would have to install the whole OS and then run it as a virtual machine. The memory consumption is humongous for such a trivial task. In contrast to VirtualBox or any other virtual machine, Docker doesn’t install the whole OS. Instead it uses the kernel and hardware of our primary computer (the host). This makes Docker to virtualize super fast and consume only a fraction of the memory we would else need. See the benefits? Imagine if we wanted to run 4 different programs on 4 different OSes. That would take at a minimum 2GB of RAM. But why would you want to run nmap on openSUSE instead of the host computer? Well this was just a silly example. There are other examples that prove the importance of a tool like Docker. Imagine that you’re a developer and you want to test your program on 10 different distributions for example. Or maybe you are the server administrator on a company and just updated your web server but the update broke something. No problem, you can run your web server virtualized on the older system version. Or maybe you want to run a web service in a quarantine for security reasons. As you see there are loads of different uses. One question might rise though: how do we separate each “virtual machine” from the rest of the stuff on our computer? Docker solves this with different kernel (and non-kernel) mechanisms. We don’t have to bother about them though, since Docker takes hands of everything for us. That’s the beauty of it afterall: simplicity. The daemon is called docker.io as you might have noticed. The client that we willuse is simply called docker. Pay attention to this tiny but significant detail. Do these two things before using docker to avoid any annoying warnings and problems. Log out and then in. In our scenario we want to virtualize an Arch machine. On VirtualBox, we would download the Arch .iso file and go through the installation process. In Docker we download a “fixed” image from a central server. There are thousands of different such image files. You can even upload your own image as you will see later. This will download a default image for Arch Linux. “base/arch” is the identifier for the Arch Linux image. See how the command prompt changed? Now we are inside the image (virtual machine) running a bash instance. In docker jargon we are actually inside a container. The string 8109626c57f5 is the ID of the container. You don’t need to know much about that now. Just pay attention to how we acquired that ID, you will need it. Host is up (0.00097s latency). Now we have the saved image locally on our computer. We can load it anytime we want to come back to this state. And the demonstration..
Once that is done we need to upload the image to the hub. However we have to save the image in a specific format, namely username/whatever. Once everything is uploaded, we can pull it from anywhere just as we did when we first pulled the Arch image. As you see, the TESTFILE is in there and we can run nmap. We are running the same Arch I ran earlier on Ubuntu, on a totally new machine with a totally different OS, but still running it as an Arch. Now you probably got a good idea on what images are. Images are simply states of a “virtual machine”. When we use docker run whatever we are running is put inside a container. A container is pretty much a Linux concept that arose recently with the recent addition of Linux containers to the kernel. In practise container is running a process (or group of processes) in isolation from the rest of the system. This makes the process in the container to not being able to have access to other processes or devices. Every time we run a process with Docker, we are creating a new container. PING www.google.com (64.15.115.20) 56(84) bytes of data. PING ds-any-fp3-real.wa1.b.yahoo.com (46.228.47.114) 56(84) bytes of data. Here I ran two instances of the ping command. First I pinged http://www.google.com and then http://www.yahoo.com. I had to stop them both with CTRL-Z to get back to the terminal. Notice that I don’t have to write the whole string. For example instead of 7c44887b2b1c, I just type the first three letters 7c4. In most cases this will suffice. Categories: Abstract, Linux Kernel, Networking, Terminal, Uncategorized, Web | Tags: container, enterprise, virtual machine, virtualbox, virtualization | Permalink. It can be hard to remember how to traverse trees by name. It can also be hard to understand the difference between traversing in different ways(postorder, preorder, inorder, level order, etc). I try here to make it easier for the reader to understand the different ways of traversing a binary tree. Intuition is the key to remembering(and visualization ofcourse). I use the words parents and children for the elements in the tree instead of nodes, root, branches and leafs. I think those words are easier to describe what is going on without getting anyone too confused. I want to firstly point out that this method is commonly called “depth/height traversal”. However I use the word recursion as it seems more appropriate to me. There are three ways to traverse a tree recursively. The only real difference between them is the order we visit the parent node. All this seems simple for a tree with only three nodes. But what happens when we have a huge tree with multiple nodes? Which node would we visit first? The answers are rather simple but there are not good resources actually to give a good visualization of how a recursive traversing can look like. The trick is to start by seeing see the whole structure as a tree with three nodes. In all three traversing methods we start with the node on the top of the tree: the root node. We thus see that as the parent in the beginning of the traversing. All the rest of the nodes on the left is considered the left child and everything on the right of it is considered the right child. The bigger complex tree has been compressed to a three-node tree. We can now start traversing it with whatever -order traversal method we want. I will demonstrate how I would go with in-order traversal. Read this line by line. 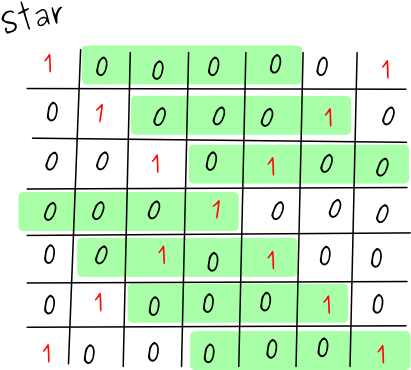 Note that 1, 2, 3 are traversal of the a, b, c nodes. All nested traversals are traversals for the nodes inside a, b and c.
An even more complicated tree could look like bellow. However exactly the same principles are valid. This looks a lot like a fractal, doesn’t it? That’s because fractals are actually based on recursion. The only difference with this example is that the recursion is not endless but instead is made of three different levels: the outer level where we see three cyan circles, the level where we see three green circles and the level where we see three nodes(inside each green circle). Breadth traversal is linear, going from one node to the next as you see the whole tree. Node with value 4(the root) belongs to level 1. Nodes 2 and 7 belong to level 2. Lastly, nodes 5, 6, 9 and 1 belong to level 3. If the tree would be more complicated or not complete(missing nodes at some level) then we just jump over the missing nodes and get to the next one. An example follows bellow. Categories: Abstract, Algorithms, Data structures | Tags: Abstract, Algorithms, Binary tree, Datastructures, Traversal | Permalink.